Want to be notified of new releases in Zebradil/hugo-theme-zeta? Pull request Compare This branch is 1 commit ahead, 72 commits behind xianmin:master. 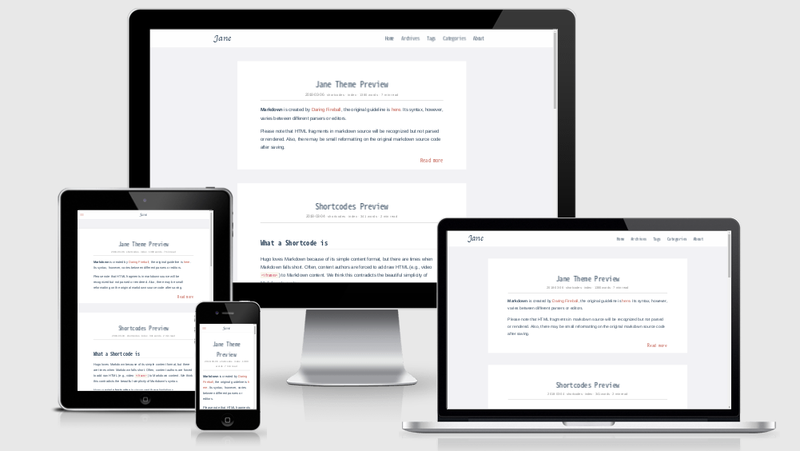 Jane is a readable theme for Hugo. It's a fork of the hugo-theme-even and made a lot of changes. This theme focuses on improving reading experience. Shortcodes : image, blockquote, music, etc. ATFeng - A beautiful blog fork from Jane. Jack Baty's Blog - Thousands of posts on the site powered by Hugo & Theme Jane. 贤民的比特记忆 - A Chinese blog. Cizel's Blog - A Chinese blog @cizel. Are you using hugo-theme-jane? Add your site to the list! Note: This tutorial assumes that you use Hugo for the first time . Hugo is one of the most popular open-source static site generators. You can check the Hugo Official Docs for more help. Download the appropriate version for your platform from Hugo Releases. Once downloaded, the binary can be run from anywhere. Ideally, you should install it somewhere in your PATH for easy use. /usr/local/bin is the most probable location. The above will create a new Hugo site in a folder named myBlog. Open http://localhost:1313/ , you will see the example site. The default config file config.toml in your site root directory. Customize it. The default content files in the ./content/post directory. Run hugo , this generates your website to the public/ directory by default. If you have extra time or want to know more about Hugo , check out the awosome Hugo Official Docs . Take a look in the exampleSite folder. This directory contains an example config file and the content for the demo. It serves as an example setup for your documentation. Copy the config.toml in the root directory of your website. Overwrite the existing config file if necessary. Front Matter : Hugo allows you to add front matter in yaml, toml, or json to your content files. # You can close(false) or open(true) something for this content. Hugo-Theme-Jane supports the creation of websites with multiple languages side by side. You should define the available languages in a languages section in your site configuration. Translations are collected from the i18n/ folder. To use the Multilingual Mode, see Multilingual Mode | Hugo . If you are interested in fixing issues and contributing directly to this theme, please see the document How to Contribute . Hugo-theme-jane is licensed under the MIT license. Check the LICENSE file for details.